Lovely looked at me with a glimmer in her eye, she had a plan and was not going to be deterred. 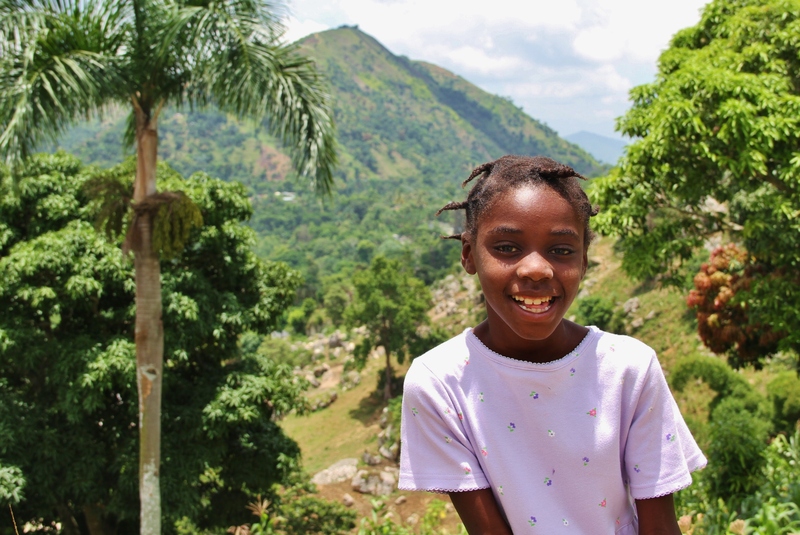 She grabbed my hand and we rapidly climbed the stairs up to the top of her mountain home in Marmelade, Haiti. As others sent a ‘good morning’ my way, she didn’t even let me stop to properly greet my Haitian friends with a handshake and reply. We promptly arrived at the cafeteria at the top, a young man and one of the mamas were finishing some rice in a bowl. She didn’t even stop to ask for some…which is incredibly unusual for her, further exhibiting her single-mindedness. We walked straight through the cafeteria to the other side, and then she walked out the side ‘door.’ It’s only likeness to an understanding of ‘door’ in my context is limited to the shape and openness, because outside the ‘door’ is straight up or straight down. Straight up. All loose dirt. Corn planted, no trees or rocks to grab onto and pull myself through the loose dirt. I can’t even see how far it is to the top, because all of the corn is so tall. I look at her again, expectant eyes, unwavering smile and holding out her hand. No words from her, as she comes back down to the cafeteria level and yells through the window in her high pitched, soft voice. I immediately think, oh, good, he will talk some sense into her. Our identical stubborn, obstinate nature collided in that moment, and immediately I found his lack of words disturbing, which was quickly followed by Wolking walking toward me and taking my hand. Taking a deep breath, I leaned down and tightened the straps of my Chacos, all while praying I wouldn’t hurt myself in the middle of nowhere mountainous Haiti, while entrusting my clumsiness to my 8 and 13-year-old friends…and then I took the plunge out the door of the cafeteria embracing the adventurous side of my friend. Lovely would run ahead and then run back. Her light, tiny body flitting around the mountain side in and out of corn stalks like the energetic sprite she resembles. Wolking never left my side. I would hesitate, and he would say, “Put your foot there.” The earth would crumble beneath my Chaco clad foot, and he wouldn’t even flinch. Realizing, this is what it would be like all the way to the top, I resigned myself to having a lot of dirt moving in directions I really didn’t want it to move on this journey. Once we were at the top, I stood there, basking in what I know to be the beauty of Haiti. Palm trees, rocky sides of the mountains and mountains beyond mountains. Wolking posed with the paper and pen he had been carrying on our journey up, then I caught a photo of my friend as he leaned against one of the many palm trees while I took photos of Lovely with the mountains beyond mountains as her background. I get it, friend. I really do. In that moment, there wasn’t any memory of the struggle up to this mountain top. There was only the realization that I’d been invited into their real space. Not their home, per se, but the space they seek and find their Savior. The sacred space of their hearts. And I was speechless. As we stood up, Lovely started darting back down the mountain, and that was when God put two images of friends from vastly different cultures next to each other. Which made her stop, and look back at me. I had a massive, excellent camera around my back and in that moment of being simultaneously in two places, I only had the wherewithal to take the image on my iPhone4. I’ve chastised myself multiple times over since that moment. Why didn’t I pull the camera around to the front? Why didn’t I use it? The reality was that this camera obsessed, photo nerd was so completely awe struck at the similarity of moments and images nearly a decade a part that I was lost in the moment. 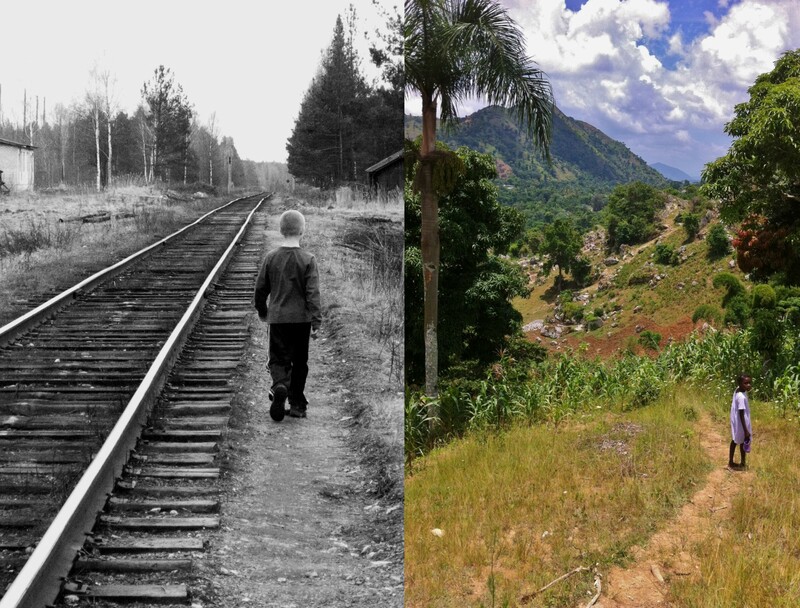 I saw Alyosha walking alongside the train tracks on one of our infamously numerous adventures in Kurlovo, Russia, and simultaneously I saw Lovely stop and look back at me as she progressed down the mountain path in an identical photo composition. It 100% took me off guard. It is the same image. They have so many characteristics that are similar that I’d never thought of before. Spunky child in unfortunate circumstances. Living in a group home with other kids with just as unfortunate circumstances. Seeking adventure. Craving friendship. Aching to be known. Wanting to share life with someone who will care and remember. Nearly an entire decade apart, in two places that couldn’t be more different than the other, with two friends that had I not chosen to be obedient to my calling into the orphan window of this world…moments I never would have shared…friends I never would have met. This is my life. This is my calling. This is my obedience. My life is not about a physical place. It is not about a certain city. A friend had to remind me of that last month. 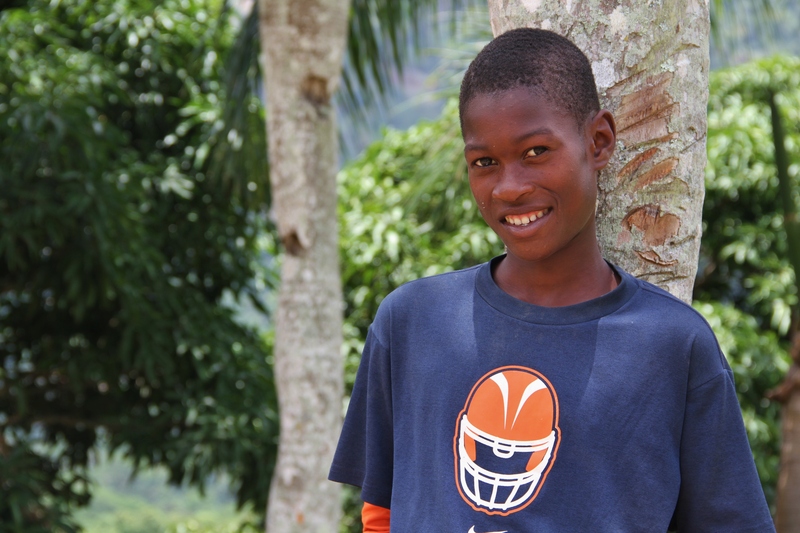 My life is about serving the one I call Savior, and being obedient to my calling into the orphan window. It is about knowing that God has uniquely gifted me to connect with and love well those the world classifies as orphans. And to draw others into the purity of those moments within the orphan window, to point to God’s presence and stir them to draw others. It is about God inspiring his people to be within his Kingdom through his children. It is about the discipleship that it takes to get to those moments, the growth beyond that submerged time and above all else, knowing some fantastic kids that need friends to be loyal in remembering and encouraging. It is about Kingdom community. We are not divided. We are meant to be one community. My friends are not sub-humans. These kids are not to be exploited to gain an end goal. They are not lesser. Quit the opposite, actually, they are more…and I am less than. They are whole. They are loved. They have dignity. They are redeemed. I will never be able to identify with their pain, abandonment, neglect and memories of death. But God has given me the honor to love them. I do believe God will purify the Stateside church through his children, but does the local church in the States have the ears to hear? Your ears are open but you don’t hear a thing. Your eyes are awake but you don’t see a thing. The people are blockheads! They stick their fingers in their ears so they won’t have to listen; They screw their eyes shut so they won’t have to look, so they won’t have to deal with me face-to-face and let me heal them. As I stood on that mountainside, reflecting in the adventures my young friends have taken me on over the last thirteen years, my heart burst with love for my friends, and commitment to know and love them well as they continue to get older. “She runs very fast,” I said to Wolking as Lovely raced down the mountainside. “I can’t run that fast,” he replied in awe starring at her. “I can’t run that fast either,” I told him laughing. And in ten years, when she is aging out of the home she has grown up in, and is faced with making choices for her future. We will stand on that mountainside and I will remind her that when she was eight, she was so fast Wolking and I couldn’t even keep up with her. This entry was posted in Adventures, Haiti, Russia. Bookmark the permalink.